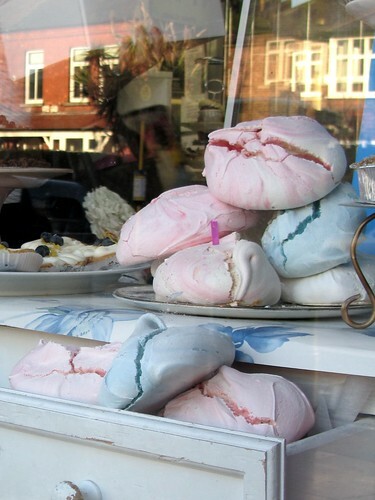 I have been eyeing these giant meringues for a while now. Each time I pass the window of The Butler’s Pantry in Donnybrook, that is. The pink ones are supposed to be raspberry meringue, the white one traditional, and the baby blue ones, errrm, I don’t know what’s the flavour actually. Should I drop in and ask? If you are wondering how big are these giant meringues, just compare against the tarts on the display dish right next to the meringue plate. I am also curious as to the amount of time it requires to bake these monstrous treats so each stays dry and airy on the inside while crispy yet not burnt on the outside. To be honest, I have never quite perfected the art of meringue baking, so I won’t attempt to whip up a batch of giant meringues just yet. must try these next time! baking them or buying them?